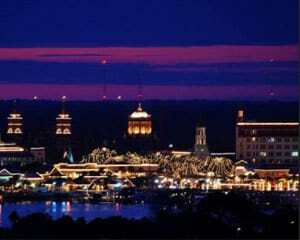 See America’s oldest city twinkle and shine on a spectacular St. Augustine Nights of Lights helicopter tour! See America’s oldest city twinkle and shine on a spectacular St. Augustine Nights of Lights helicopter tour! Lauded as one of the world’s 10 best holiday displays, St. Augustine’s Nights of Lights celebration continues ancient Spanish Christmas tradition in the grandest of styles with over 3 million tiny white lights festively decorating the historic town, beaches, and surrounding landmarks. And what better way to experience all of the holiday splendor than with a helicopter bird’s eye view? As you rise into the night sky, you’ll immediately swing east to North Beach to see the lights illuminate the gorgeous shore as well as such sights as Castle Otttis, Usina Bridge, Porpoise Point, Anastasia Island and The St. Augustine Lighthouse, and the St. Augustine Beach Pier. Then you’ll turn north along the Matanzas River to see the water of the river and bay alight from the glow of the lights bedecking the Bridge of Lions and the city itself. 20th Anniversary of famous St. Augustine Nights of Lights celebration, one of the top 10 holiday lights displays in the world! Illuminated landmarks include the Bridge of Lions, Plaza de la Constitucion, Lightner Museum, St. Augustine Beach Pier, the 125 year old Hotel Ponce de Leon, and more! Wonder at Florida’s Historic Coast luminous with holiday magic and make a holiday memory to be cherished on a St. Augustine Nights of Lights helicopter tour. Nights of Lights traditionally begins the Saturday before Thanksgiving and continues nightly through January 31.